My previous post about Romans alerted me to the fact that this summer, it is 20 years ago that I started my working life. Feel free to point out that made me 12 years old at the time, thus making employment illegal. Yes. I know. My first job was volunteering at the theme park ‘Archeon‘. Putting willow branches in place to give a backbone to the wall. I was very much interested in history, and delighted to find out they were starting to build an archeological theme park, on cycling distance from my home. The aim of the park was to be as historically accurate as possible. All the buildings that needed to be built, would be built by the tools of the era. For all this hand work they needed a lot of muscle. I applied to be a member of the supporting volunteer organisation, and helped  build several houses during 1994. 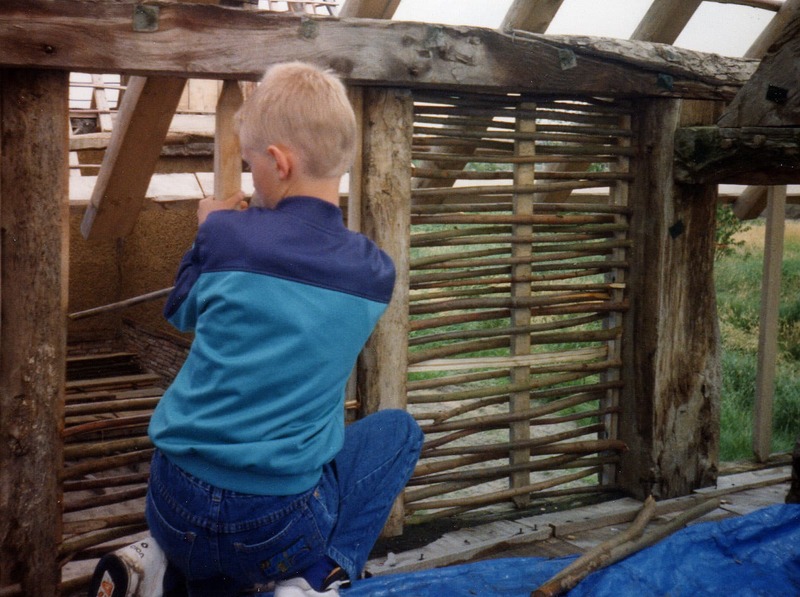 This work was mainly building walls; using loam  to fill in panels between the woodwork of the 14th century and bronze age houses. The construction was quite simple: branches were woven in a rudimentary wall, then the loam would be smeared across the woodwork until it filled up the panel. 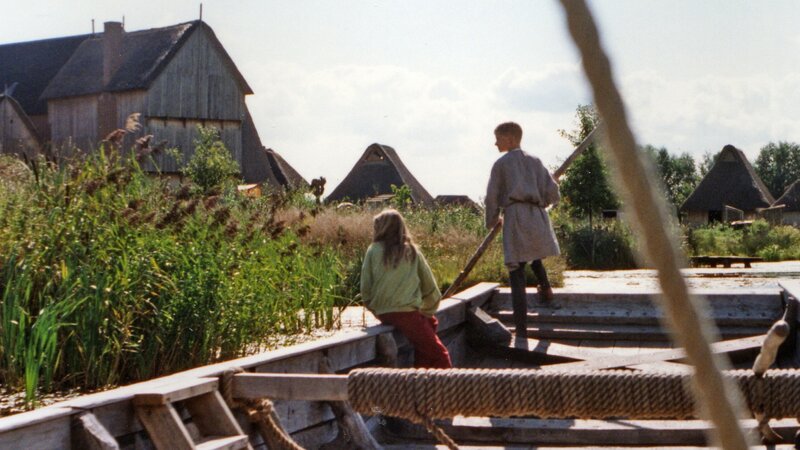 In this way we helped build the blacksmith’s house, the fisherman’s house and a bronze age long house. Me, posing with my axe in front of the shoemaker’s house. The park was very big, leaving a lot of room to just wander through the nature, and to stumble upon little details and vignettes in the landscape. When it opened in the same year, I visited the park quite often. The next year I was encouraged to join Archeon again, as now my school mate was working in the park as a volunteer in the medieval time period, as a shoemaker’s apprentice. This sounded great, and I joined him as an apprentice. The whole summer, every Sunday morning, I would get on my bike, and cycle to Archeon. There, I would go to the changing room above the medieval bakery to get my shoes, and dress up in my home made medieval outfit. Our job was simple; we had to walk around the medieval section, make it look like we belonged there, and basically do whatever we wanted. 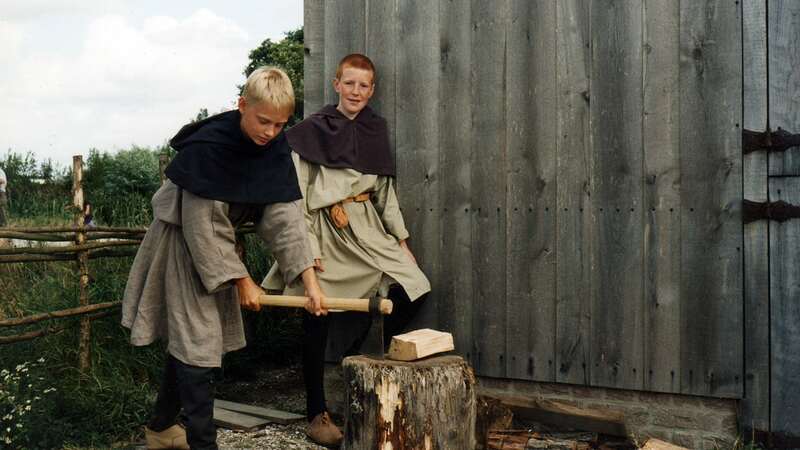 This usually meant taking the fishing boat out, chopping wood for lunch, shooting bows, showing people how leatherworking was done and help out in other ways, as medieval boys would. Pushing the ship to it’s harbour. 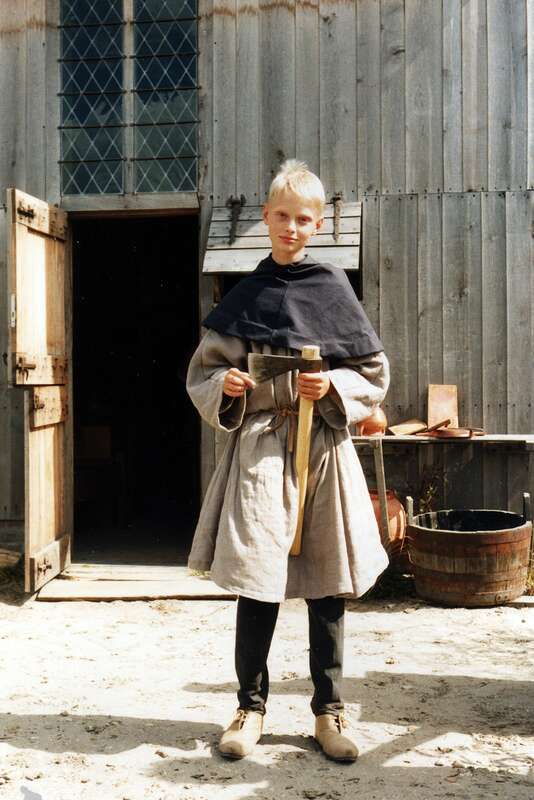 In 1996 it was going downhill for Archeon. The upkeep of the huge park grounds and main pavillion was becoming a problem, as was the mismanagement. I had to fight to be allowed back as a volunteer, the organisation didn’t seem interested anymore. Finally it was agreed that I could be a helper on the Roman river boat that ferried visitors between the Roman and Medieval time periods . Even if this was harder work, it was fun and still allowed for lots of time to walk around the park. Unfortunately, this was also the year that Archeon went bankrupt. The park got new management, and around two thirds of the grounds were sold off. Even the main building, containing the gift shops and time machine  was sold, cut up, and shipped out. Observing the carpenter’s wife at work. In its slimmed down form the park survived. A more commercially oriented manager was installed, who found a commercially sustainable baseline for the park. I never went back as a volunteer, but kept visiting the park now and then when events were organised. As local media it was fun to walk around the park and take pictures or shoot video. The park is doing well now. It recently built a replica of a Roman villa, and there are vague plans to start a sister open air museum in Britain. I’ll remember Archeon as the place where I started my career, and had lots of fun being a medieval person. I’ve always listed it on my resumé, as it gave me a valuable experience in unique circumstances.